Real Ale is turning 22, and you’re invited! We’re throwing another iconic Real Ale anniversary party, which means beer, food, music, and (new this year!) cocktails. 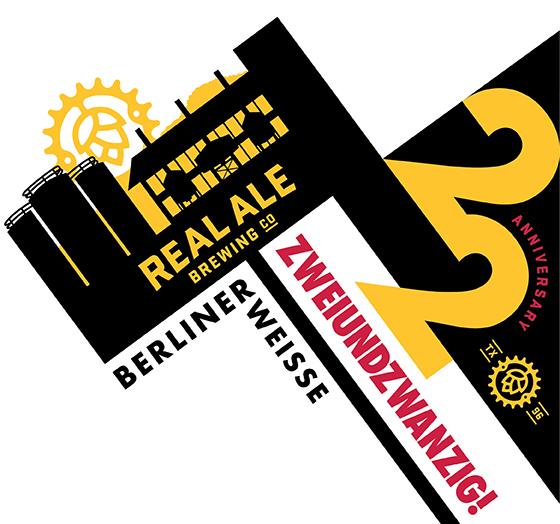 This year’s anniversary beer is known as “ZWEIUNDZWANZIG“- it will be a crushable, refreshingly tart Berliner Weisse. RSVP on our Facebook event to stay up-to-date on more event details. A beautiful Hill Country setting and a glimpse of our brand new 120bbl brewhouse! No need for cash – parking is FREE. Some tented seating areas will be available. We recommend bringing your own chair if you want to stake out a sweet home base under the trees. We also recommend comfortable shoes for walking the grounds. A ridiculous amount of specialty and year round draught beer to choose from. We’ll also have water and sodas for DDs and kids. Entertainment for the whole fam. The music lineup will keep your ears occupied, and face painting, a balloon artist and leaf pressing to help entertain the kids. A limited-edition Real Ale 22nd anniversary glass available with ticket purchase while supplies last. Food available for purchase from some of the finest local food vendors (vegetarians/vegans, we’ve got you covered). Special (maybe surprise?) tappings throughout the day. The party will go on rain or shine from noon to five. If you’re interested in volunteering and are already TABC certified, please email info@realalebrewing.com. It’ll be big. Details to come! *Mysterium Verum specialty beers and Real Spirits Cocktails will be concentrated in one of our three bars, all tapped at noon, and they’ll only stay on as long as they last. Each 21+ person who pays for a ticket will receive four drink tokens. 1 specific token will be redeemable for a Real Spirits Gin or Whiskey Cocktail! If you’re not into cocktails, you can use all 4 tokens for beer. Buying a party ticket automatically gets you a raffle ticket. You’ll need to stop by the merch booth by 3:30 to drop off yours. Stay tuned for prize details! There will be parking available in a large grass lot near the brewery. Please be on the lookout for signage. Parking is FREE this year! No need for cash. We encourage carpooling when possible. Entry for kids (21 and under) and DD’s is free – food is available for purchase from individual vendors. Yes, but it’s much easier if you buy them in advance. You can even do it from your phone, in your car, in the parking lot. It’s that easy. Do I really need my ID? Yes. Really. Even if you haven’t been carded in 30 years, please bring a valid photo ID to verify your age. No. Each 21+ person who pays for a ticket will receive four drink tokens. We will not be selling additional tokens due to the high number of anticipated attendees. What’s the deal with the Real Spirits Cocktail Bar? Each 21+ person who pays for a ticket will receive four drink tokens. 1 token will be redeemable for a Real Spirits Gin or Whiskey Cocktail! If you’re not into cocktails, you can use all 4 tokens for beer. You can contact info@realalebrewing.com with questions.